This classically styled beauty of a bed will be the centrepiece of any bedroom in the house, from the master to the guestroom. Fully upholstered headboard, footboard, and side rails provide a cozy look and the soft linen fabric completes the warm, inviting feel of this bed. The diamond-patterned stitching and button tufted headboard create a comfy backdrop and the sturdy bentwood slat support system provides full support without requiring a box spring. Coffee-finished solid wood feet pull the look together perfectly. Add quality and style to your bedroom decor with this one of a kind bed. With it's unique nail button and diamond tufting detail, this bed steals the spotlight in your room. Upholstered in smooth linen fabric and handcrafted in plush foam padding for added support and comfort. Spot clean only. Manufactured in Illinois. Easy assembly required. Mattress and box spring required. Every Skyline Furniture piece is custom-made to order. 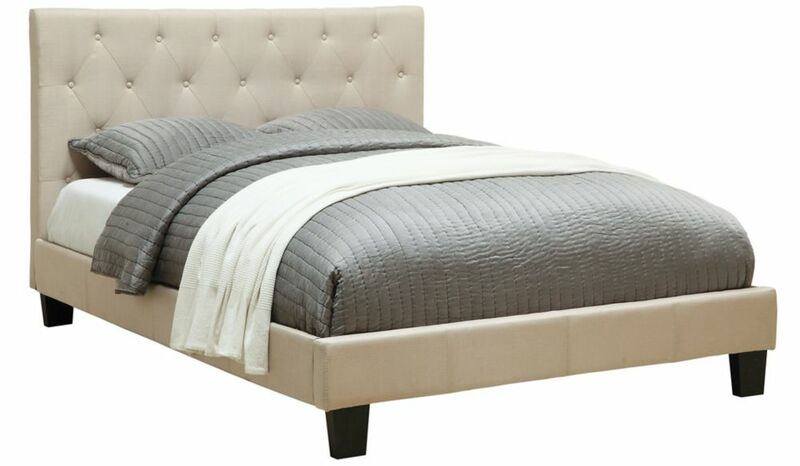 Elegance and luxury unite with this exquisite nail button wingback bed. Upholstered in soft twill, this bed boasts an abundance of carefully handcrafted diamond tufts. To add, the wings are finished with a gleaming double row nail button trim. It is sure to add instant panache to your bedroom dicor. Manufactured in Illinois. Easy assembly required. Mattress and box spring required. Every Skyline Furniture piece is custom-made to order. This bed is sure to add a stylish look to your bedroom dicor. It features beautiful metallic linen upholstery with an arched border design. Its plush foam padding adds extra comfort. Mattress and box spring required. Easy assembly required. Spot clean only. Every Skyline Furniture piece is custom-made to order. Summit-54 Inch Bed-Natural Linen This classically styled beauty of a bed will be the centrepiece of any bedroom in the house, from the master to the guestroom. Fully upholstered headboard, footboard, and side rails provide a cozy look and the soft linen fabric completes the warm, inviting feel of this bed. The diamond-patterned stitching and button tufted headboard create a comfy backdrop and the sturdy bentwood slat support system provides full support without requiring a box spring. Coffee-finished solid wood feet pull the look together perfectly. Summit-54 Inch Bed-Natural Linen is rated 2.0 out of 5 by 1. Rated 2 out of 5 by Ella19 from Bed broke after a year I bought this just over a year ago. It looks nice, obviously you get what you pay for so it isn't going to be high-end. However, I weigh 120lbs and after one year of use this bed just broke underneath me as I was sleeping. The middle support legs totally gave out. I will update with photos later, but I am quite disappointed with the quality of this bed. Is this bed for a double-size mattress? Do any stores have samples that I can view? I live in Calgary AB and I'm wondering if there are show rooms or samples anywhere to view the item before ordering it. Is there a way to get photos with higher resolution?